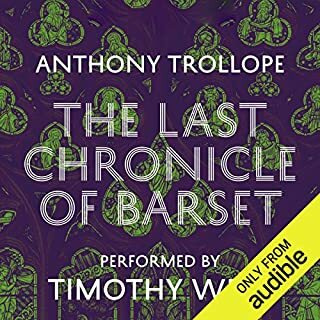 In the last and most complex of the Barsetshire novels, many of Trollope's best-loved characters appear, but the mood of the novel is darker and more uneasy than in earlier volumes. At the heart of the novel is the penniless Reverend Josiah Crawley, first encountered in Framley Parsonage, who in the opening of the book is accused of theft, creating a public scandal that threatens to tear the community apart. I love the reader's voice and envy his talent for taking on characters - there are others readers who are also blessed with this talent. We do need an Oscar type award and ceremony. ?